Republican Rocky Chavez currently represents Assembly District 76 and will not be termed out until 2024. Chavez is running for United States Senate and will give up this seat. This will be an open seat in 2016 and it is expected to remain Republican. Assemblymember Rocky Chávez began his public service career immediately after graduation from California State University, Chico when he joined the United States Marine Corps. He spent more than 28 years as a United States Marine, rising to the rank of Colonel and being assigned Chief of Staff for the 4th Marine Division. Upon retiring from the Marine Corps, Rocky continued his legacy of public service by founding the School of Business and Technology, a charter High School in the Oceanside Unified School District. He served as the school’s Director from 2002-2008. In November of 2002, Rocky was elected to the Oceanside City Council. During his seven years of service he focused on economic development, public safety and quality of life issues. In 2009, Rocky was appointed by then-Governor Arnold Schwarzenegger and made the journey to Sacramento to serve as Undersecretary of the California Department of Veterans Affairs. He later served as Acting Secretary. 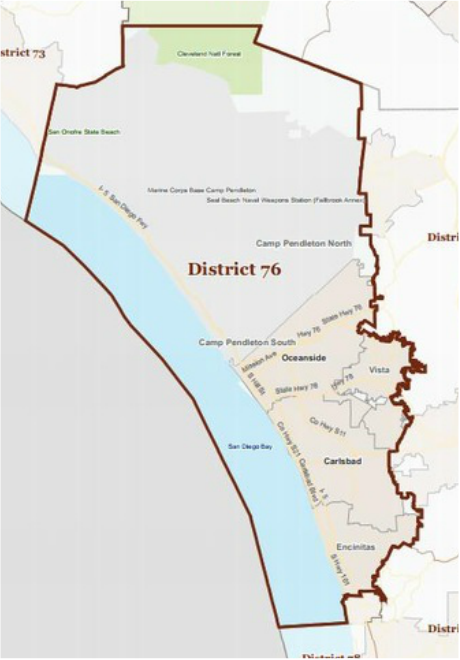 Rocky was elected on November 6, 2012 to represent the 76th Assembly District which includes Camp Pendleton, Carlsbad, Encinitas, Oceanside and Vista. Rocky serves as Vice Chair of the Assembly Veterans Affairs Committee and Higher Education Committee. He is also a member of the Rules, Education, Budget, Health and Utilities and Commerce Committees. Rocky also sits on the California Task Force on Science, Technology, Engineering and Mathematics Education and serves as a member of the Governor's Military Council. Rocky and his wife Mary live in Oceanside, and have three children and five grandchildren. Mary studied at the University of New Orleans and also holds an M.B.A. from California State University, San Marcos. His son Temujin Tom is a physician in South Carolina. Rocky’s daughter Regina Ann Shepperson and youngest son Sage John are both college graduates.